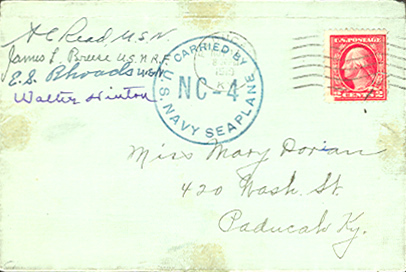 Cover Signed by the four crew members of the NC-4, bearing the imprint “Carried by U.S. Navy seaplane NC-4” with the post mark, November, 1919. Signed by Al Reed, M.S.N; James L. Breese U.S.N.R.F; E. S. Rhoades, U.S.N. ; & Walter Hinton in the top left portion of the envelope. The NC-4 was the first aircraft to cross the Atlantic Ocean. The plane then made recruiting flights over the Mississippi and Ohio Rivers. This cover was carried on one of those flights. Fine.